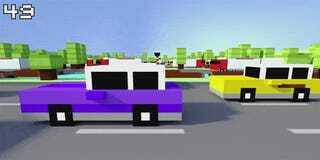 Endless traffic hopper Crossy Road is a delightfully frustrating game. Switch the perspective from top-down-ish to first-person however, and it's a recipe for a heart attack. With its charming block graphics and colorful characters it's easy to fall in love with endless street hopper Crossy Road. I did it. Mark Serrels of Kotaku Australia did it. Even YouTube filmmaker Andy Front has, and he's giving back by making me breath funny and feel slightly nauseous. The last thing I need on top of the Frogger-like frustration developer Hipster Whale already built in to the Android and iOS game is not being able to see the cars bearing down on me. I do not need to turn around just in time to see a semi or a train bearing down on me. My heart couldn't take it. That said, it does sort of look like it would work, doesn't it?